Avril Lavigne and Niceklback’s frontman Chad Kroeger have kept it mum for six months, but after dating since February, Lavigne accepted both Kroeger’s proposal for marriage and his dazzling wedding ring on August 8. Lavigne’s rep broke the news to People. The two met up when they co-wrote a song for Lavigne’s fifth studio album. All the pleasures and frustrations of co-creating music must have sparked possibilities between the two. “A romantic relationship blossomed as they spent time writing together,” one of Lavigne’s friends told People. Lavigne, 27, divorced her first husband, Sum 41′ s Deryck Whibley, in 2009, and she’s also dated Brody Jenner. Kroeger, 37, meanwhile, is as yet unwed. 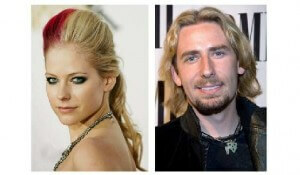 Nickelback, a band of mixed success, including die-hard fans and astringent critics, and Lavigne are both Canadian rockers. News of their union has inspired a twitter riot, as fans and enemies tweeted in to voice their opinions. Damien Fahey, @DamienFahey, 22 Aug 12, Here’s to Avril Lavigne marrying Chad Kroeger and one day giving birth to a happy, healthy Now That’s What I Call Music! CD. Zach Braff, @zachbraff, 22 Aug 12, So THATS who likes Nickelback. Death Star PR @DeathStarPR. 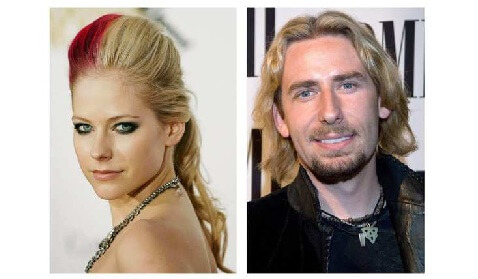 21 Aug 12, Avril Lavigne and Nickelback’s Chad Kroeger are getting married! To celebrate, we’re exploding your planet before the inevitable duet!